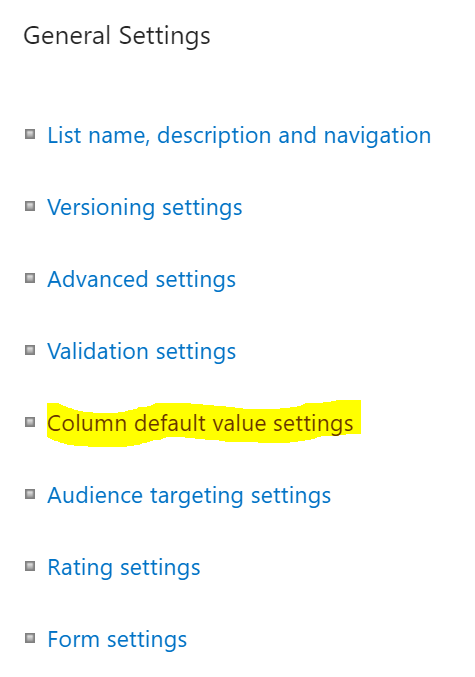 First navigate to the document library settings page and select “Column default value settings”. On this page you get an overview of all the metadata you can define default values for. Click on the desired metadata field you want to define the default value for. When you proceed to upload a document in the library, the default value is automatically set, as configured above. When we need to set these default values for multiple libraries in multiple sites, we prefer to configure this with Powershell. The default values are stored in the Forms-folder in a file called “client_LocationBasedDefaults.html”, which contains an xml-markup of the settings. This file does not exist when no default values have been set. An event receiver is added to set the default values when a file is added to the library. Save this file and name it “client_LocationBasedDefaults.html”. The next step is to edit the file. After editing the file, we need to upload it again to the SharePoint library. If the file did not exist yet, we need to attach the event receiver as well. With some additional Powershell code you can iterate over sites and libraries and then call the functions above to make the magic happen.